Thank you for choosing to use a Resene paint. You have made the first step towards having an attractive, durable paint finish that will give you many years of satisfaction. 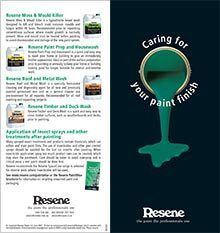 Follow the care and cleaning recommendations in this brochure to help you keep your Resene paint finish looking its best for longer. Avoid cleaning the paint finish until at least four weeks after application to ensure it has had sufficient time to fully develop its properties. Keep any cleaning to a minimum to avoid damaging the paint film. If you have sensitive skin, wear gloves when using cleaning solutions to avoid irritation. If you require any product application advice or have any further questions, please contact your local Resene ColorShop or Reseller or in Australia: call 1800 738 383 or visit www.resene.com.au; in New Zealand: call 0800 RESENE (737 363) or visit www.resene.co.nz. If using Resene Interior Paintwork Cleaner ‘concentrate’, dilute before use. For light soiling dilute 1:60 with water; for medium soiling dilute 1:50 (approximately one teaspoonful to one cup) with water; for heavy soiling dilute 1:40 with water. If using Resene Interior Paintwork Cleaner ‘ready to use’ no further dilution is required. 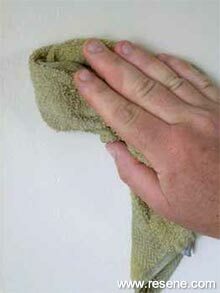 Dip a soft lint-free cloth into the Resene Interior Paintwork Cleaner solution. Do not saturate the cloth as this could lead to runs and streaking. If using a spray pack, apply Resene Interior Paintwork Cleaner direct to the surface you wish to clean. Using light strokes, thoroughly wipe the area to be cleaned turning the cloth frequently to maintain a clean edge. Wipe away any excess solution. Wring the cleaning cloth out into an empty bucket before dipping it into the detergent solution again. This will minimise the appearance of streaks. order to achieve an even finish, dry the surface with one final wipe using a soft dry lint-free cloth in the direction of the paint flow. If trying to remove a localised mark, start from a radius wide of the mark and work towards it. This will minimise any ‘tide mark’ that might develop. Be aware that walls, like windows, can accumulate a faint layer of dust or grime. A seemingly minor job of cleaning a small spot can lead to a major cleaning job! If unwillingly caught in this predicament, a feather duster can sometimes minimise the boundary between the cleaned and uncleaned areas. Always test the cleaning method in an inconspicuous area to ensure the cleaning process you plan to use does not damage the finish of the paint. Wait until the test area has dried before using the same technique on more conspicuous areas. 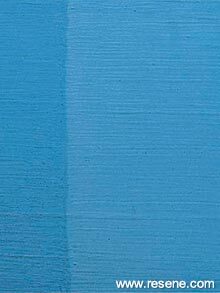 Walls may appear discoloured as they absorb the water, but should dry back to their original colour. 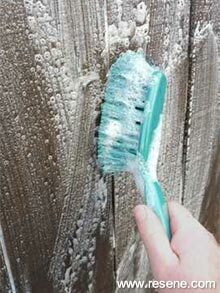 Do not vigorously scrub the surface nor use an abrasive or strong cleaning agent as you may burnish the paint surface and mar the paint finish. Do not wash walls for four weeks after painting, as waterborne paints require this period of time to fully cure. Like washing your car, cleaning your house will help it maintain its good looks for much longer. Airborne contaminants, including salt deposits, which settle on your paint film, can attack the surface and cause premature breakdown. Annual washing of your home will help maintain the fresh appearance of your paintwork. Moss and lichen can penetrate the surface of the paint film, damaging its integrity and reducing the useful life of the film, while mould growth can destroy the chemical entity of the resin system that holds the paint system together. The presence of moss, mould and lichen will hold moisture on the surface longer, promoting further growth of these organisms and increasing the risk of damage to the coating. Removal using the appropriate washing procedure will increase the life of the coating and maintain the aesthetic properties of the paint finish. For an instant fresh appearance, regularly wash down your home with Resene Paint Prep and Housewash diluted as recommended with water. Apply the diluted solution with a soft broom. Wash off with copious amounts of freshwater. For a slower-acting, longer-term clean, use Resene Deep Clean. Designed for general maintenance of exterior weathered surfaces, Resene Deep Clean is a slow release cleaning agent. Simply apply Resene Deep Clean diluted as recommended with water to weathered exterior areas, such as discoloured cementitious surfaces or lightly moss infested walls, and leave. The combination of Resene Deep Clean and natural weather conditions will slowly break down surface contamination leaving a Resene Deep Clean cleaner surface. Most detergents can have a negative effect on fish life so avoid letting the washings run off into the stormwater system. Attend to areas of flaking paint, stained paint (treat the source of the stain, then touch-up the paint finish as required), moss and mould, and rotten areas of timber. Moss and mould will grow through the paint surface and if left untreated will ruin the fresh appearance of the paintwork. If major moss and mould infestations appear, treat them with Resene Moss & Mould Killer diluted as directed with water. Wash off with copious amounts of freshwater. Bleach is a very effective moss and mould killer, however residues can decolourise subsequently applied paint finishes, particularly when used over a porous surface. If you are repainting, ensure all bleach treated surfaces are allowed to weather and/or are thoroughly rinsed prior to repainting. If you are planning to wash down a freshly painted house or building, wait at least four weeks from the completion of the painting job to give the paint time to fully cure. If debris is being carried onto the building during painting, cease work and restart when the air is clear. Debris carried onto a wet building may be trapped into the paint film and will be impossible to remove later without removing the paint finish itself. Waterborne interior products in particular are vulnerable to surfactant leaching, where some areas of the paint surface appear to be covered in white streaks, giving a watermark effect. Surfactant leaching only affects the appearance of the paint finish, not its durability. It cannot be accurately predicted or prevented, but tends to occur when moisture settles on a film, such as in a steamy room like a bathroom, when there is moisture in the air on a cold and wet day or in humid conditions. Colours with higher levels of tinter are most prone to surfactant leaching. Surfactant leaching is caused by water sitting on freshly applied waterborne paints. Water softens the fresh paint and draws out water soluble surfactants. As water dries off these are deposited on the surface. These deposits are easily removed early on by simply cleaning the surface following the interior paintwork instructions. The problem may occur once or twice again before all leachable material is completely removed. If left, the deposits may etch the surface and leave a permanent mark. This should diminish over a few months and is only of cosmetic concern. Surfactant leaching is usually associated with marginal painting conditions. Tinted paints are more prone to surfactant leaching than are white paints because of the ingredients that are present in tinters. To prevent surfactant leaching, it is best to avoid application in the late afternoon if cool, damp conditions are expected in the evening or overnight. Ensure adequate ventilation is maintained during the drying period. If surfactant leaching does occur, clean the surface as soon as possible to avoid permanent marking using these cleaning recommendations. Bright interior colours, such as reds in particular, can be vulnerable to pigment transfer, where a tiny amount of the pigment can be removed when wiped with a cloth. Pigment transfer does not affect the appearance of the paint finish, nor its durability, however it can cause marking on other items that come into contact with the paint finish, such as sofas and curtains. Simply wipe the surface area evenly to remove the loose pigment. Alternatively, a clear coat such as Resene SpaceCote Clear can be applied. Thermoplastic paints (most waterborne paints fall into this category), particularly those with a high gloss, will soften under heat. Even a surface that may appear fully cured will soften and may stick to itself or other thermoplastic materials placed upon it, such as vinyl covered folders. The plasticiser in vinyl is prone to migration into touching surfaces. Where possible, avoid storing vinyl covered objects on or against painted surfaces. An enemy to your paint finish is excess moisture. Well constructed modern homes with aluminium doors and windows are almost 100% airtight. Unfortunately this has disadvantages in that any moisture generated in the house from showers and even occupants breathing will not be able to escape unless special ventilation is provided. Rooms on southern aspects can get quite damp and often mould results. Moisture can be reduced through the installation of dehumidifiers or specially ventilated aluminium windows. Large amounts of moisture are generated during the interior decorating process. It is critical that good ventilation is maintained throughout the drying period. The best way to achieve this is to open windows to encourage airflow and use heaters to warm the air temperature. If ventilation is poor, the paint finish may not fully cure. Excess moisture can lead to surfactant leaching, blistering and mould problems. While dampening a porous surface can ease paint application in exterior situations, paint will never cure over a permanently wet surface and blistering may result, particularly on horizontal surfaces where water is liable to pond. In common with all exterior surface coatings, the colour of your paint finish may be affected by U.V. light. Resene uses the finest pigments commercially available, but even these are liable to change after constant exposure to sunlight. Any changes will be gradual, but after a few years the difference between shaded and exposed areas may become noticeable. Resene paints are designed to resist fading, however the combined presence of strong U.V. light and lime in the surface can lead to premature fading. Sometimes lime staining is mistaken for fading. Lime staining occurs when the lime in the surface has leached through and is deposited on top of the paint surface as a white deposit that looks similar to fading. If this occurs, the lime must be blocked off with a suitable paint system. 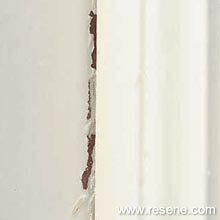 Resene recommends all fresh plaster surfaces are coated with Resene Limelock first. Resene Clearcoat UVS U.V. protective glaze may be used as a finish coat over freshly painted bright organic hues and shades to protect these more vulnerable pigments against fading. › View Habitat article on fading. ‘Chalking’ refers to the formation of a white, chalky powder on the surface of the paint film, which often occurs as the paint weathers and the binder is slowly degraded by sunshine and moisture, releasing the binder’s hold on the pigment. Over time nearly all paints will show some chalking when they are subject to outdoor exposure. Old paint is likely to be chalky. Paints are essentially a combination of pigments – colour particles held together by the paint resin as the paint dries a thin layer of clear resin is left on the surface and the colour pigments are locked in below this layer. After years of sun and moisture degradation this thin resin layer simply wears or erodes away – exposing the pigments below and as they are no longer bound into the paint film by the resin they are easily wiped off and this is what is referred to as chalking. 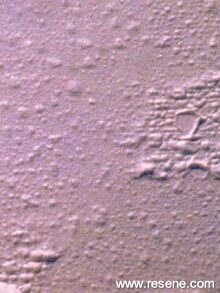 This slow erosion is much more preferable than cracking or flaking and, provided the surface is sound and cleaned, once the chalk is removed it is ideal for painting over. Chalking is generally worse when enamel paints or lower sheen waterborne paints have been used. Taking a shortcut, such as skipping a primer or topcoat of paint because the paint seems to have already covered or to save time or money, can cause premature chalking. Over a porous surface the paint resin may be absorbed into the surface, which will reduce the amount of protection on top of the surface. It’s always best to apply the full system recommended as cutting corners does not save time or money - it ultimately costs because you will need to redecorate earlier. Chalking is more common with flat paints and white or very light-coloured paints that contain high levels of titanium dioxide and extenders. A low degree of chalking is often beneficial to whites and off-whites, since it tends to rid the surface of a certain amount of dirt and mould. Excessive chalking is detrimental because chalk can run-down onto the underlying structure (e.g. brickwork) and deface the appearance of the surface, it can lighten the colour of the paint and/or it can erode the paint film resulting in a loss of protection to the substrate. Chalk needs to be removed before repainting and can be considered to be in the same category as dust and dirt. 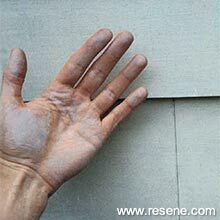 Use Resene Paint Prep and Housewash to clean off the chalk. If the surface is badly chalked, it may be time to consider a clean and repaint. Resene Deep Clean is the simple, safe method of keeping all your outdoor areas free from moss, mould, algae and lichen. Simply spray or brush on and leave Resene Deep Clean and nature to do the work. Slow acting Resene Deep Clean gets right down to the roots of the problem, destroying the growth and combining with U.V. light and rain to weather off the remains to leave a Resene Deep Clean surface. Ideal for use on paths, patios, decks and other exterior cementitious, timber and painted surfaces. Resene Interior Paintwork Cleaner is a labour saving nondulling neutral cleaner designed for use on all interior painted surfaces. Quick and easy to use, it dries film-free eliminating the need for rinsing. Available in concentrate or ready to use variants. Resene Moss & Mould Killer is a hypochlorite based wash designed to kill and bleach most common moulds and fungus within 48 hours. Recommended prior to repainting cementitious surfaces where mould growth is normally present. Moss and mould must be treated before painting to avoid discolouration and damage of the new paint system. Resene Paint Prep and Housewash is a quick and easy way to wash your home or building to give an immediately fresher appearance. Ideal as part of the surface preparation prior to painting or annually to keep your home or building looking good for longer. Suitable for interior and exterior work. Resene Roof and Metal Wash is a specially formulated cleaning and degreasing agent for all new and previously painted galvanised iron and as a general cleaner and pre-treatment for all repaints. Recommended for all roof painting and repainting projects. Resene Timber and Deck Wash is a quick and easy way to clean timber surfaces, such as weatherboards and decks, prior to painting. Resene Heavy Duty Paint Prep and Oil Remover is a biodegradable, phosphate free powerful cleaner for removal of dirt and grease prior to painting. Many sprayed insect treatments and products contain chemicals, which can soften and stain paint films. The use of insecticides and other pest control sprays should be avoided for the first six months after painting. When insecticide applicators spray too much product runs can be created, which may stain the paintwork. Care should be taken to avoid overspray and in critical areas a test patch should be done first. Resene recommends the Resene SpaceCote range is selected for interior work where insecticides will be used. See the Resene PaintWise brochure or www.resene.co.nz/paintwise.htm for information on recycling unwanted paint and packaging.